Tuttle Publishers has given me an excellent sets of origami set for beginners to review. (You can read all of the reviews on my blog by going to my ““Reviews & Giveaways” page). The publishers have kindly agreed to give (given) a set of free to two random visitors to my blog (one set each)! This set, called “Ultimate Origami for Beginners Kit: The Perfect Kit for Beginners“ by origami masters Michael G. LaFosse and Richard L. Alexander, includes an instruction book, a step-by-step instruction DVD, and 62 origami papers. This set is perfect for anyone interested in Japanese art in general…but especially in learning Japanese origami (art of paper folding). I’m not very good at origami…but I was able to fold many things by following the steps on the DVD and in the book! You can buy “Ultimate Origami for Beginners Kit: The Perfect Kit for Beginners” through Amazon here. But, as I said above, Tuttle Publishers is going to give (given) one free set of each of these origami papers to two random visitors to my blog (one set for each winner)! This special promo ended on 2015 April 5th. Two random winners were selected and contacted directly by Tuttle Publishers (via email) with the details about the free sets. Thank you to all who entered, but only the winners were contacted. Tuttle Publishers has given two more sets of origami papers to review. This time it’s two sets of origami papers with Geisha prints. The publishers have kindly agreed to give (given) a set of each free to two random visitors to my blog (one set each)! These sets, called “Origami Paper: Geisha Prints“, each have eight beautiful ukiyoe designs of geisha. One set has origami that are 6¾ inches (square) and the other has 8 ¼ inches paper. Both of these sets of origami are perfect for anyone interested in Japanese ukiyoe art or art in general, folding origami, or Japanese culture. The artwork on each piece is gorgeous! Both sets come with illustrated step-by-step instructions for folding a variety of origami animals, toys, kimono, etc. You can buy “Origami Paper: Geisha Prints”(6¾ inches) here and (8 ¼ inches) here. But, as I said above, Tuttle Publishers is going to give (has given) one free set of each of these origami papers to two random visitors to my blog (one set for each winner)! This special promo ended on 2014 October 25th. The random winners were selected and contacted directly by Tuttle Publishers (via email) with the details about the free origami sets. This is the fifth in my series of reviews for Tuttle Publishers. This time it’s not a book, but origami paper with famous ukiyoe prints. And, once again, Tuttle Publishers will kindly be giving (gave away) one free set of these papers to a random visitor to my blog! The details about the giveaway will be at the end of this post. Do you like origami? Are you interested in Japanese ukiyoe woodblock prints? How about traditional Japanese culture? Or even art in general? If so, then you will certainly like “Origami Paper: Hiroshige Prints“! This set contains forty-eight 6¾ inch origami papers printed with famous ukiyoe artwork by the master ukiyoe artist Hiroshige. It also comes with an instruction sheet explaining how to fold six things such as the iconic “paper crane”. You can buy “Origami Paper: Hiroshige Prints” here. But, as I said above, one random visitor to my blog will receive (received) this origami set directly from the publisher. This special promo ended on 2014 October 11th. One random winner was selected and contacted directly by Tuttle Publishers (via email) with the details about the free origami set. To show gratitude to the people of many countries around the world for supporting and helping Japan in the aftermath of the Great Earthquake in Sendai of 2011 March 11, Japan will host a special event in London, England that will be called “Arigato in London“. This event will feature many aspects of Japanese culture including photos and a movie of the Earthquake affected area that will also include many Japanese children expressing thanks to people around the world, Japanese food, beer and 日本酒 (Japanese sake alcohol), Japanese tradional games and traditional arts and music. To allow many people from many different countries to attend, this event will be held in London from 2012 July 28 until August 11 to coincide with the Olympics that London will be hosting then. Click here to visit the “Arigato in London” website. 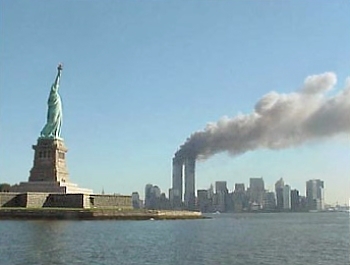 Today is 2010 September 11. Nine years since the 2001 September 11 terrorist attacks on the World Trade Center. Last year I wrote a post about Sadako Sasaki. She was a young girl in Hiroshima when America dropped the atomic bomb on that city in 1945 and she developed leukemia from the radiation and died at the age of twelve. 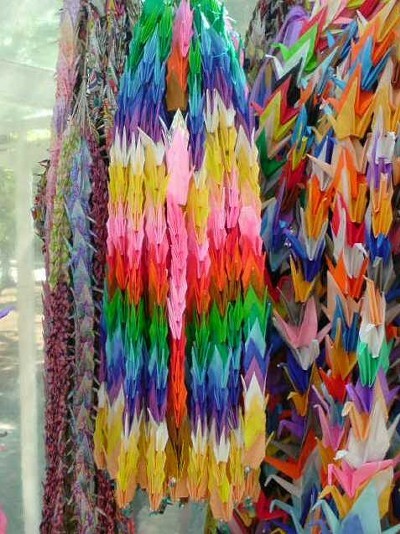 The story of the 千羽鶴 (“1000 origami cranes”) that she folded while in the hospital is well-known in Japan. Almost all of the origami cranes that Sadako Sasaki folded were cremated with her when she died, but her family kept a few of the cranes. Sadako Sasaki’s surviving brother learned of a memorial in New York to the Japanese employees of Fuji Bank‘s New York branch in the World Trade Center who died in the 2001 September 11 attacks. This memorial included thousands of origami paper cranes…and now one of those cranes is one of those folded by young Sadako Sasaki before she died in 1955.